The Roscoe Medical Steel Transport Chair has a traditional steel frame with a double-coated chrome or powder-coated finish that is attractive, chip-proof, and easy to maintain. The Roscoe Medical Steel Transport Chair has a traditional steel frame with a powder-coated finish that is attractive, chip-proof, and easy to maintain. 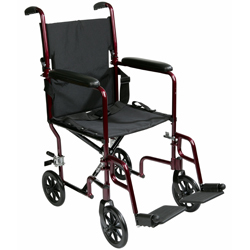 Weighing less than 26 pounds, it is equipped with comfortable, padded nylon and a folding backrest that makes it easy to pack and go. Comes complete with a seat belt for added safety. Tool-free swing-away, aluminum footrests with heel loops come standard. Overall Width with Arms: 23 ½"